Daylight photography is the easiest for cameras but shooting in poor lighting conditions is where some of the advanced features become handy. The xenon flash of the Nokia Lumia 1020 will obviously be a great boon for it, but the LG G3 is the only phone with optical image stabilization. It has the so-called "laser focus" too, which should prove quite valuable. As usual, we've included the best and worst shots - there's so much that can ruin a photo taken in poor lighting conditions (camera shake, missed focus, wrong white balance) and this way we can show the dependability of a phone. Some take good shots most of the time, some are 50/50. First up, photos taken in Normal mode with the flash disabled. We used the 5MP shots from the Nokia Lumia 1020 and they show rich detail and no noise, even though they were shot at ISO 800 (there is noise visible in the 38MP shot though). However, the Lumia dropped the shutter speed to a slow 1/10s, which perhaps could have been handled by the OIS but as you see on the crops, it missed focusing correctly one or few times. There's also issues with the white balance - the wall in the background should be white, yet it's greenish. The LG G3 used a leisurely shutter speed, 1/13s, but thanks to its optical image stabilization there's no blur. Keep in mind we used a static scene for the test - moving objects will still come out blurry at this slow shutter speed. Still, at ISO 450 there's little noise and the fine detail is on the level though noise reduction takes away some of it. The Apple iPhone 5s has one of the oldest cameras here but performed surprisingly well. The shutter speed was rather slow (1/15s) but we somehow avoided camera shake. At ISO 400 there isn't much noise though photos are still a little soft. Also the white balance is too warm. We used the 8MP Superior Auto shots from the Sony Xperia Z2. It picked a brisk 1/32s shutter speed so it had no issues with handshake. There's a good deal of noise (ISO 800) but the amount of detail is comparable to the iPhone. 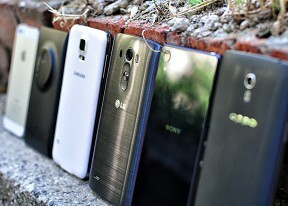 Despite touting the advantages of its ISOCELL sensor, Samsung photo quality still suffers in low-light situations. With 1/17s shutter speed it succumbed to camera shake and at ISO 640 there's noticeable noise. That and noise reduction keep the fine detail low. The Oppo Find 7 "worst case scenario" produced the blurriest shot of the bunch. The 1/15s shutter speed can't be entirely to blame, most likely missed focus played its part too. The photo that turned out okay actually looks pretty good compared to the rest, with most of the noise removed (and some of the fine detail with it). The Find 7 used the highest ISO of the bunch, 900. Next we enabled the camera flashes and repeated the same test. When it comes to flash photography, the Nokia Lumia 1020 has the massive advantage of its xenon flash - it helped the shutter speed go up to 1/50s meaning you can photograph moving objects without worrying about blur. Not only that but the ISO went down too, and at ISO320 the best case scenario image looks great, there's tons of detail and no noise. The Lumia software managed to mangle the white balance again, though this time to the polar opposite - it's too yellowish. The "worst" photo of the Lumia 1020 has strong blur, but that's a definite case of missed focus - the photo was taken with the same 1/50s, ISO 320 settings as the good shot. The phone has an LED light that can act as an auto-focus assist but it's much weaker than the xenon and its range is limited. The Apple iPhone 5s surprisingly leaps ahead here. Its dual-LED flash is not among the strongest and its true tone LED setup didn't help with the white balance (it's a tad too warm). Shutter speed was practically unchanged but the ISO dropped to 125 leading to low noise levels. There is some camera shake-induced blur though. The Sony Xperia Z2 flash helped it drop the ISO a bit and with the already fast shutter speed it proved a reliable shooter. There's a good deal of noise though, which swamps the fine detail even at the reduced 8MP resolution of Superior Auto. The relatively strong LED flash of the Samsung Galaxy S5 managed to improve reliability and shutter speed went up to 1/30s (matching the Xperia's), which reduced issues with camera shake blur. The lower ISO also helped reign in the noise but the flash threw the white balance off. The LG G3 once again leaned on its OIS and kept shutter speed slow. That's okay for this static scene but for moving objects or people it's going to be a problem. The noise reduction came on way too strong though and our plush subject looks unnaturally smooth. The white balance turned to the bluer side of things. That said, the laser autofocus (which uses a dedicated IR emitter to help the camera focus in low light) and all photos were in focus, even ones in the dark with the flash turned off. The Oppo Find 7 fumbled badly here. Its flash was of little help increasing shutter speed or lowering ISO and the final results are a noisy mess. The Find 7 also couldn't settle on exposure and some photos turned out too bright, others too dark.